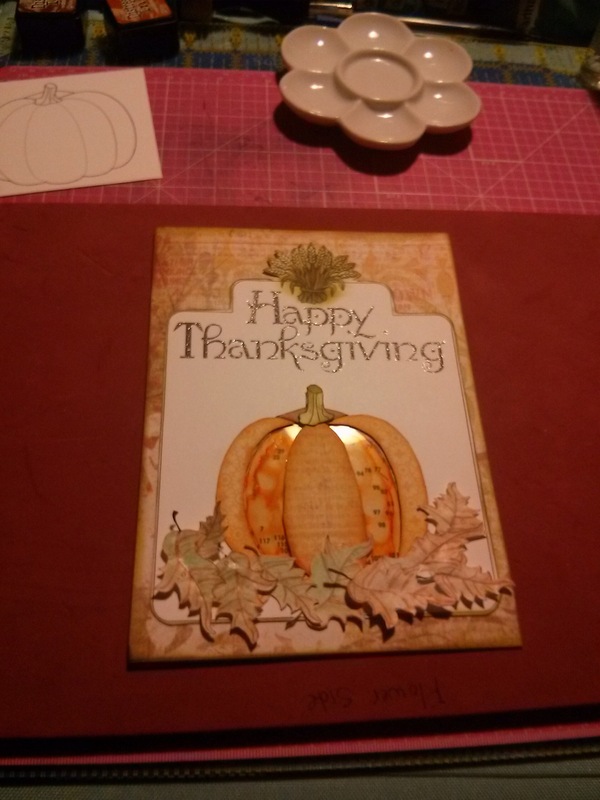 Here is the Last Minute Thanksgiving card I made for this year. You will find the art work and instructions to make your own below. This has been the easiest card I have made so far. It also might be my favorite to date. It is a great activity for kids to do while waiting for their turkey dinner. Card stock for 5″ x 7″ card base; I used 110lb. Card stock to print the IMAGE PDF on; I used 80lb. The cut outs hold up better if they are printed on card stock. Piece of acetate larger than the pumpkin. You can even use it from cardboard boxes that have the clear plastic windows. Recycle/Reuse. Scissors. You may want a blade to cut an X in the center of the pumpkin cut out. Tape and glue or a Xyron X sticker maker and foam or pop dots. Ranger Distress Vintage Photo ink or something similar to edge the images. Pencils, gel pens or markers to color the leaves. If you use water color pencils, don’t forget the water! I used a water brush and just wiped it off in between colors. Alcohol marker to color the back of the pumpkin acetate. Zig Wink of Stella clear marker. If you don’t have one, you really should look into them. A way to curl the leaves, even if you bend them around a pencil.